Status: Common, locally abundant, regular winter visitor statewide. Common regular spring and fall migrant statewide. Uncommon regular resident statewide, except southwest and southern Panhandle. Uncommon regular summer visitor statewide. Documentation: Specimen: UNSM ZM7697, 31 Oct 1921 Hall Co.
Taxonomy: Two subspecies are generally recognized, although Pyle (2008) considers the species monotypic, with size differences clinal. Populations in the northern United States, Alaska, and Canada are subspecies washingtoniensis, and those in the southern United States and northern Mexico are leucocephalus (Gill and Donsker 2017). According to AOU (1957), southern leucocephalus bred “formerly” north to Nebraska, but had been extirpated by around 1900 (Jorgensen et al 2010). It is unknown whether the major increase in Nebraska breeding Bald Eagles in recent years resulted from expansion southward (washingtoniensis) or northward reclamation of the former breeding range (leucocephalus). Changes Since 2000: This species has undergone a large increase in breeding numbers since the first such record in 1991. 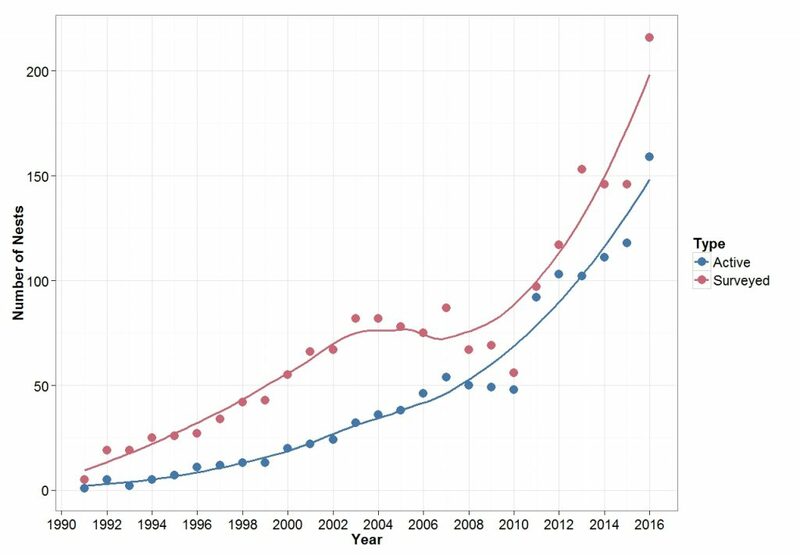 In 2000 there were 20 known active nests, by 2015 there were 118, and in 2016 another increase, to 161 and an estimated 209 in 2017 (Jorgensen and Dinan 2018; see Appendix A). 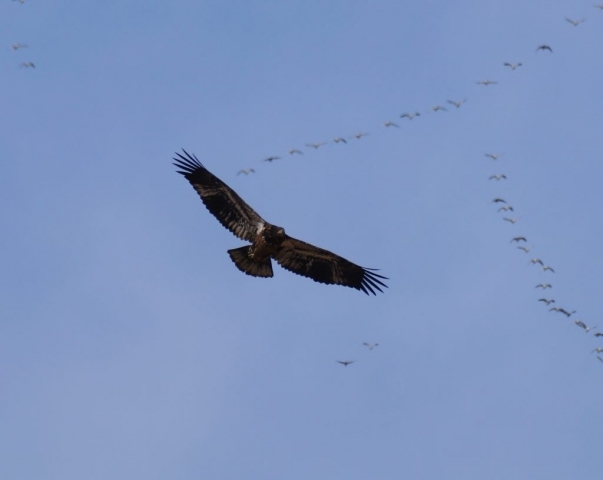 During this period, there has been a sizeable increase in numbers of summering immature non-breeders, as well as migrant and wintering Bald Eagles, although wintering numbers are influenced by weather conditions and fluctuate widely from year to year (Jorgensen and Rehme 2008). Resident: Observations suggest some, and possibly many, of the Nebraska breeding birds remain through winter; some Kansas nesting birds are considered “permanent residents” (Thompson et al 2011). Spring: Migratory movement is evident in Feb-Mar as ice cover melts and numbers continue to build into early to mid-Mar, waning quickly by early Apr. Peak numbers usually coincide with peak northward passage of waterfowl. It is difficult to determine late dates as scattered nesting pairs and immatures occur in the state during summer. Most late Apr and May reports are of non-breeding sub-adults, although nesting adults may travel significant distances while foraging. High counts: 800 at Calamus Reservoir, Loup Co 24 Mar 2010, 500 there 18 Mar 2017, and 273 there 12 Mar 2009. Summer: The first modern nesting attempt was in Cedar Co in 1973 (Lock and Schuckman 1973). A nest site along the North Platte River in Garden Co was attended 1987-98 but was never successful (Rosche 1994, Wingfield 1988). The first modern successful nesting in the state was in 1991, when an eaglet was fledged from a nest near Valley, Douglas Co (Omaha World Herald 29 May 1996, Korpi 1991); it later died, but two were fledged from the site in 1992 (Lackey 1997, Korpi 1992). Nesting also occurred at Calamus Reservoir, Loup Co in 1992. Birds were reported in Scotts Bluff Co 23 May 1990 and 25 Aug 1992 and nesting first occurred there at Lake Alice, North Platte NWR, in 1993 (McKinney 1993). In the years since, the number of active nests in Nebraska has increased dramatically, with 118 active nests in 2015, 161 in 2016 and an estimated 209 in 2017 (Jorgensen and Dinan 2018). Around 80% of the known nests were located along river valleys from the Platte River north and east of Lincoln and Cherry Counties. Breeding birds have yet to colonize most of the southwest and southwest Panhandle. Only two nest sites, one of which was not active, the other an active nest at Medicine Creek Reservoir, Frontier Co in 2016, have been documented south of the Platte River and west of Harlan County (Jorgensen and Dinan 2018). Nesting was first recorded in the Rainwater Basin in Clay Co in 2019. This landscape has few developed watersheds and riparian corridors with large cottonwood trees that are typically used as nest sites. Nesting adults may be far-ranging in search of food and may appear almost anywhere associated with medium to large rivers, lakes and reservoirs, even though they may not be nesting close by. As in spring, it is difficult to determine the status of sightings Jun-Aug, although any sub-adults sighted are likely to be wandering non-breeders. Two 3- or 4-year-olds were nest-building near Halsey, Thomas Co 26 Feb 2003 (Ruth Green, personal communication), but such attempts by immatures are rarely successful. Fall: The proliferation of breeding birds in recent years in the state has tended to mask the start of fall migration, although an indicator is the occurrence of several (five or more) birds together. Using this standard, migration is noticeable by mid-Oct and peaks in late Nov. Significant numbers of birds may linger until weather conditions and snow and ice cover reduce food availability. Winter: Early winter distribution may be extensive, provided that lakes and rivers remain open. As ice cover develops, individuals congregate at preferred locations along major river valleys. From 1980 to 1995 an average of 744 bald eagles were counted in Nebraska during the annual midwinter surveys. From 1996 to 2011 the average increased to 990 bald eagles. Nebraska stopped midwinter eagle surveys in 2013 because the species’ population was determined to be recovered (Jorgensen and Rehme 2008). High counts: (at single locations): 316 at Harlan Co Reservoir, Harlan Co 30 Jan 2015, 284 at Kingsley Dam, Keith Co 11 Feb 1994, and 128 at Harlan Co Reservoir 14 Dec 2018. Comments: The story of the decline and subsequent recovery of Bald Eagle numbers in the United States is well-known. Until federal laws were instituted and enforced, Bald Eagles were unprotected in the “Lower 48” and thus subject to shooting during the early 20th Century. In 1940 the federal Bald and Golden Eagle Protection Act was signed into law, which protected Bald Eagles and their nests. Also detrimental to the welfare of the Bald Eagle was the development of pesticides and their application following World War II. The use of chlorinated hydrocarbon insecticides (DDT and its relatives) led to their entering food chains and subsequently accumulating in the bodies of large predators like the Bald Eagle. Acting as hormone mimics, they caused production of eggs whose shells were so thin that they were crushed when incubated. Bald Eagle populations plummeted over much of the already reduced range until public concern led to a ban on chlorinated hydrocarbon insecticides in 1972. A federal Endangered Species designation was initiated in 1978, following which the Bald Eagle began its remarkable recovery. It was ultimately removed from the federal and Nebraska list of threatened and endangered species in 2007 and 2008, respectively. Figure 1. Number of surveyed and active Bald Eagle nests in Nebraska, 1991-2016; from Jorgensen and Dinan (2017). Points represent actual counts and trend line created using locally weighted scatterplot smoothing (LOESS) in R Studio (2015). Figure 2. Spatial distribution of active Bald Eagle nest sites in 2016; from Jorgensen and Dinan (2017). Figure 3. 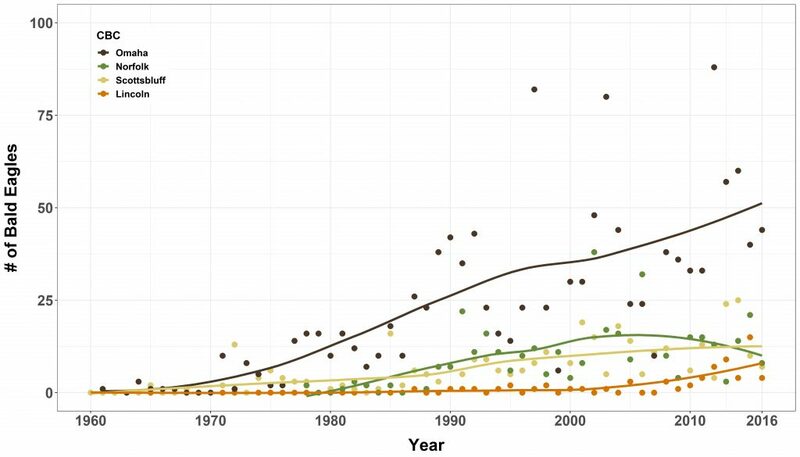 Number of Bald Eagles recorded on selected Christmas Bird Counts (CBCs) during the period 1960-2016. Points represent actual counts and trend line created using locally weighted scatterplot smoothing (LOESS) in R Studio (2015). Jorgensen, J.G., and L.R. Dinan. 2018. 2017 Nebraska Bald Eagle Nesting Report. Nongame Bird Program of the Nebraska Game and Parks Commission, Lincoln, Nebraska. Jorgensen, J.G., and L.R. Dinan. 2016. 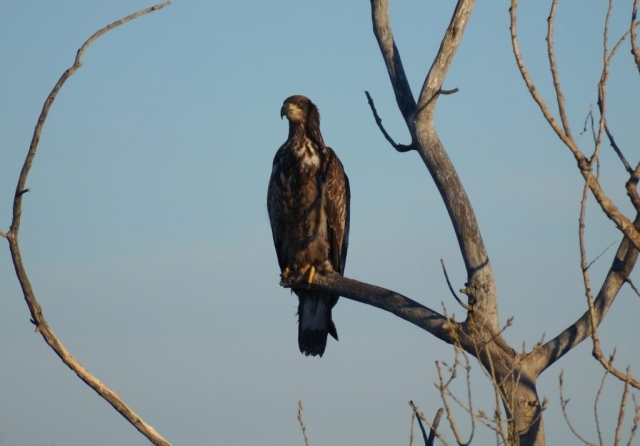 2016 Nebraska Bald Eagle Nesting Report. Nongame Bird Program of the Nebraska Game and Parks Commission, Lincoln, Nebraska. Jorgensen, J.G., and S.E. Rehme. 2008. 2007 Nebraska midwinter Bald Eagle survey. NBR 76: 81-83. Jorgensen, J.G., S.K. Wilson, J.J. Dinan, S.E. Rehme, S.E. Steckler, and M.J. Panella. 2010. A review of modern Bald Eagle (Haliaeetus leucocephalus) nesting records and breeding status in Nebraska. NBR 78: 121-126. Korpi, R.T. 1991. Bald Eagle Hatchling. NBR 59: 50-51. Korpi, R.T. 1992. Bald Eagles Hatched in Nebraska. NBR 60: 59. Lackey, J. 1997. 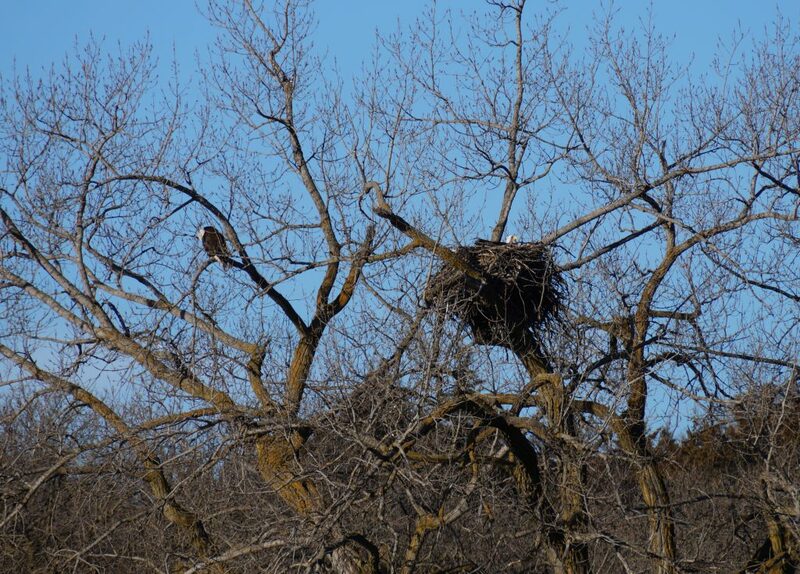 Recent Bald Eagle nesting activity in Nebraska. Prairie Naturalist 29: 275-276. Lock, R.A., and J. Schuckman. 1973. A Bald Eagle nest in Nebraska. NBR 41: 76-77. McKinney, B. 1993. Bald Eagles nest at North Platte National Wildlife Refuge. NBR 61: 138-139. Wingfield, G. 1988. A second Bald Eagle nest in Nebraska. NBR 56: 47-48.